Shop On Stage Drum Set Microphone Rim Clip and Stand Package from AMS with 0% Interest Payment Plans and Free Shipping. The On Stage Drum Set Microphone Rim Clip and Stand Package is the perfect package for anyone that needs to mic drums with out the bulk of a bag full of mic stands. 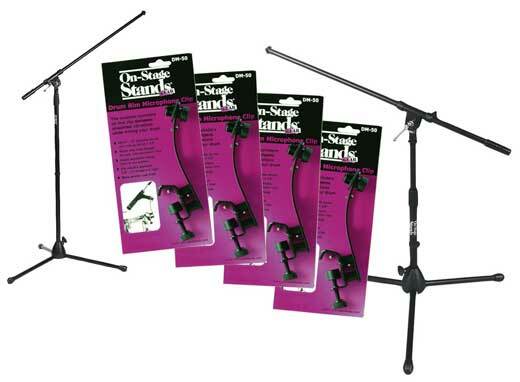 The On Stage Drum Set Microphone Rim Clip and Stand Package comes with four On Stage DM50 drum rim clip microphone mounts, one On Stage 7701B tripod boom stand and one MS7411B short tripod boom stand for the greatest flexibility in drum micing. Our best selling stand! This Euro Boom boasts hybrid sheet metal and high-impact plastic leg housing making it unbreakable. A removable boom arm and its ability to fold flat make this stand a must for every member of the band. Also features a cast steel mid-point clutch. Setup height is freely adjustable from 36" to 63 inches. Ideal for guitar amps, drums, guitar or bass speakers cabinets and lots of other applications. The stand is adjsutable up to 15.5" and the boom extends up to another 19". Convenient design and durable construction with a high-impact plastic leg housing make this stand a tremendous value. Its folding legs allow for the most compact storage.